I was up at 2 am, showered, dressed, had my quiet time, and finished packing for my trip to Dodge City, KS. I drove to Shreveport, LA, and caught a 6 am flight for DFW, on to Denver, and then a Great Lakes Airlines flight to Dodge City. I will be preaching tonight at 7, Saturday at 7, and both Sunday morning and night at the BIBLE BAPTIST CHURCH of Dodge City. NOPE, I’ve not met Matt Dillon yet. I think I saw the LONGBRANCH, but I didn’t go in. I am however staying at THE DODGE HOUSE. Pastor Albert Schrock has been pastoring here for seven years. He is a former Amish member who trusted Christ and ended up being called into the ministry and was trained at Hyles-Anderson College under Dr. Jack Hyles. A shot was heard around the fundamental world when at a national conference it was declared that the King James Bible supporters who believe it has preserved inspiration are ignorant and if not ignorant should lie to the layman while knowing the truth. Then we were told by the same people that there are 22,000 mistakes in the King James Bible. Apparently God is unable to preserve the words as well as the inspiration of his word for the English speaking people. When the California head of the MASTER’S COLLEGE said and penned the thought that the blood of Jesus Christ dissipated at the foot of Calvary and only the death of Jesus saves the fundamental world was outraged. However, when it is one of ours that says the King James Bible was “hammered out by the sweat and labor of those at Hampton Court like a mother giving birth” and only the originals contain “inspiration” we are to roll over and pull the covers over our heads while going back to sleep. I THINK NOT! This KING JAMES BIBLE CONFERENCE is crucial and essential to the future of the cause of Christ. Satan has risen his ugly head again and the attack is not new, but it is being disguised and covered with the cloak of loyalty to an institution of which Dr. Jack Hyles warned us. Dr. Hyles thundered and even called the name of Professor Stewart Custer of Bob Jones University for such heretical statements. If Dr. Hyles were alive and this were being taught at Hyles-Anderson College the whole lot would be fired. I am not putting words in the mouth of Dr. Hyles for this is exactly what he said and wrote. Dr. Hyles would not even sign an NIV Bible! 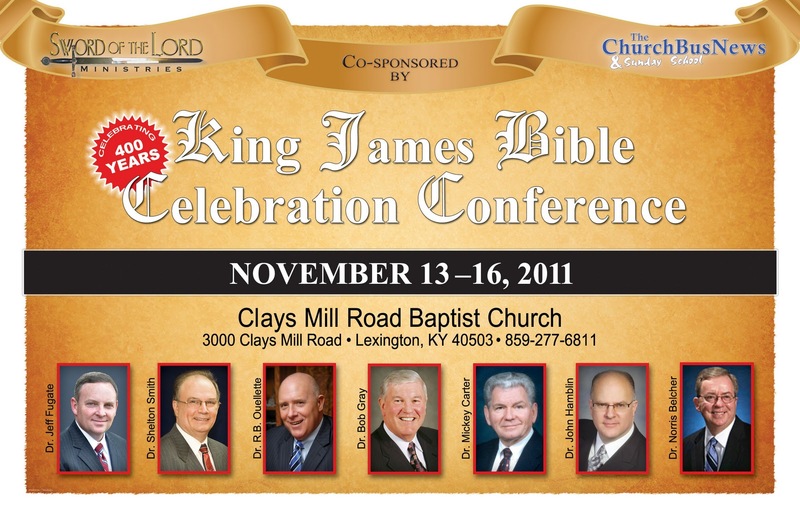 I hope to see you at the KING JAMES BIBLE CONFERENCE in Lexington, KY. Please take time and come hear clear and concise teaching and preaching on our precious SCRIPTURES. GOTTA LOVE THE KING JAMES BIBLE!